What began more than four decades ago came to official completion Friday as Fayette County Commission members cut the ribbon that officially opened Lake McIntosh Park and Reservoir in Peachtree City. The site located at the end of TDK Boulevard will double as a Fayette County park and drinking water reservoir. There is more to Lake McIntosh than a reservoir for drinking water. The property at the end of TDK Boulevard includes a family-friendly park with walking trails, a picnic pavilion, a playground, a gazebo, restrooms, boat ramps and docks and substantial parking for golf carts and automobiles. The 650-acre lake is situated along portions of the west side of Peachtree City and straddles the Fayette-Coweta County line. Fed by Line Creek, the lake extends from just south of Ga. Highway 54 West southward to just north of Falcon Field. Most of the lake-front land is in Coweta County. The dam at the south end of the lake was dedicated in December and it took an unexpectedly short amount of time for the reservoir to fill. The reservoir will provide 10.4 million gallons per day of drinking water for Fayette County. 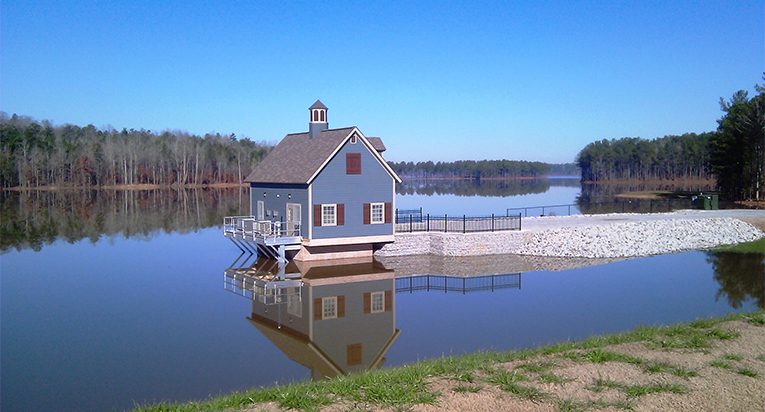 Fayette’s other drinking water reservoirs include Lake Peachtree and Lake Horton. As for the park rules, it will be open from 6:30 a.m. until 8:30 p.m. during daylight savings months and from 6:30 a.m. until 6 p.m. during the remainder of the year. Only boats with electric motors, canoes, paddleboats and sailboats may be used. Fishing is allowed from the shore and from boats and applicable state rules apply. All animals must comply with the county leash law. Swimming, skiing, scuba diving or other bodily contact with the water is not permitted and there can be no alcohol in the park and reservoir. And though the stipulation may change, the islands in the reservoir are currently off limits to the public. Non-county residents will be required to pay a $10 entrance fee. For more information on the park and park rules call 770-461-1146, ext. 5 Monday-Friday from 8 a.m. until 5 p.m. The site that would become Lake McIntosh was initially identified by developers in 1962, just three years after Peachtree City was incorporated. The lake site was purchased by Fayette County in the 1970s. It was in 1981 that the required 404 permit was submitted and then withdrawn over various state and environmental concerns. The permit was re-submitted in 1998 and won approval from the U.S. Army Corps of Engineers in July 2007. And in 2009 the Safe Dams program approved the project.